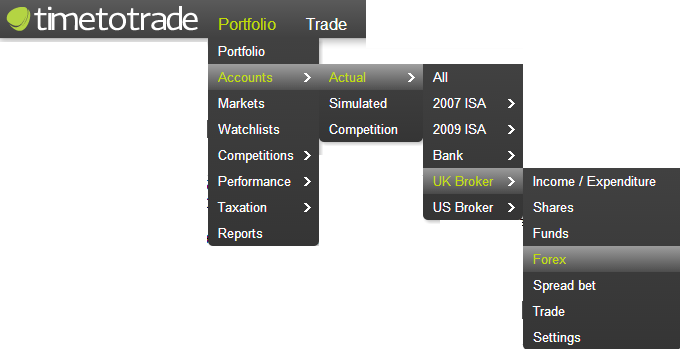 The Portfolio Accounts can be used to track Forex investments in multiple currencies. In this section we will discuss how to add, edit and delete Forex transactions in your Portfolio Account. If you have entered a transaction but it is not displayed, please check that the 'start' and 'end dates' are set to the appropriate time frame associated with the missing transaction. 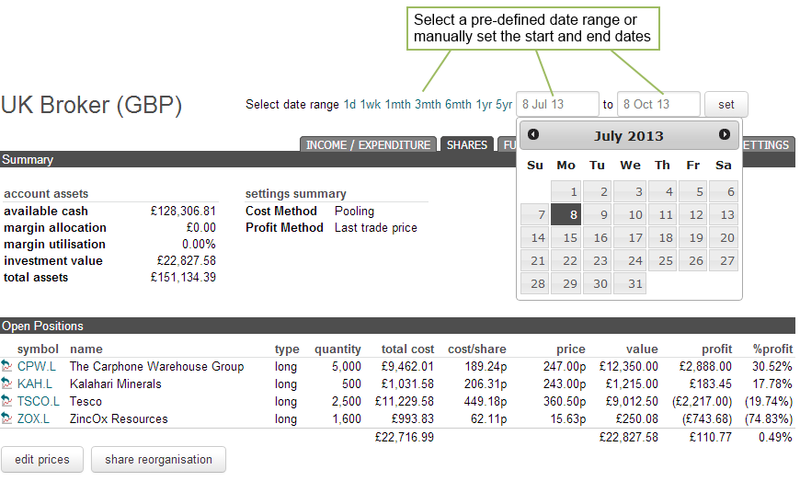 You can now enter the Forex transaction details in the fields as illustrated in the following screen shot example. When dealing with forex currencies, the base currency is the first three letters in the forex symbol and the counter currency is the last three letters e.g. for GBPUSD the base currency is GBP and the counter currency is USD. Symbol: Enter the Forex symbol using the format recognised by timetotrade if automated price updates and historical valuations are required. If you are unsure of the symbol, start typing the company name into the 'symbol' text field. A drop down menu will appear displaying possible matches and their associated symbol. Margin: Enter the margin value for opening positions whereby you can enter the cash allocated or a percentage value e.g. 1%. If a percentage is used the margin will be calculated based on the base currency value. Quantity: Input the Forex lot transaction size. Rate: Input the forex transaction price. Commission: Input the amounts of any commissions or fees payable on the transaction. When entering a transaction, you do not have to enter the commission, you can just enter the total cost, however, it is recommended that you complete all fields as this information is also used for generating reports. Please note that the commission associated with a Forex transactions is based on the Portfolio currency. Rollover: Enter the rollover and swap charges if the position is held over night; alternatively enter these via the Income/Expenditure if you are not sure what transaction the rollover and swap fees are associated with. Please note that the rollover associated with a Forex transactions is based on the Portfolio currency. Profit/Loss: Enter the Profit / Loss value. If the Portfolio is set up to settle in the Account Currency, then enter the Profit or Loss value in the Portfolio currency. If the Portfolio is set up to settle in the Counter Currency, then enter the Profit or Loss value in the Counter Currency. Once you have finished adding your Forex transactions to the account, click on the "done" button as illustrated above. Please note, if the transactions are not visible check the date range; timetotrade will only display those transactions which occurred between the specified start and end dates. Once complete, to return to normal view, click on the 'done' button.